For some reason, I’ve come to associate Jane Yolen with fairy tales, although she’s written a lot more than that. She’s the author of the How Do Dinosaurs… series of picture books, the Commander Toad series for young readers, fiction for adults, and seemingly everything in between. However, Foiled is her very first graphic novel. Yolen explains on her website how Foiled came to be—it’s a little bit about her granddaughter, who was learning to fence at the time, and a little bit about her own experiences with fencing. It’s got magic, high school, first dates, D&D, subways and trolls. And since Yolen was a fencer herself, you can be sure that all the fencing terminology is accurate. Aliera Carstairs is in high school, where she just doesn’t really fit in. She’s not a jock, not a prep, not a goth, not a nerd. But she’s been fencing since she was eleven, and she’s good—good enough that her coach thinks she has a shot at nationals. Her life revolves around fencing, reading, and playing RPGs with her wheelchair-bound cousin Caroline. That is, until Avery Castle shows up at her school. Avery is charming and gorgeous, and suddenly all of Aliera’s “looks don’t matter” ideals are a lot harder to hold onto. When Avery ends up as her biology lab partner, she finds herself making jokes and stuttering her speech. But despite Avery’s perfect looks and easy wit, there’s something a little off about him. I won’t spoil the story, but it’s a combination of growing up, falling in love, and discovering a new depth to the world. Yolen sprinkles fencing metaphors throughout the story; the chapter headings are all named after stances and movements. The artwork is nice, with just a touch of manga-inspired exaggerated facial expressions here and there. But what’s really nice is the way Cavallaro uses color: most of the book is a sort of green-grey monochrome, reflecting Aliera’s color-blindness, but there are spots of color that really shine and fit in with the story. My only real complaint about the book is that there seems to be a whole lot of exposition without a lot of action. That may be an unfair assessment, since I’m an adult male and the book is probably best suited to adolescent females, but I felt like the payoff—you could sense it coming but you weren’t sure what it would be—takes a long time to get to. And then, right when a whole world of possibilities opens up for the story, it’s over. I haven’t seen anywhere that Yolen intends to write a follow-up, but Foiled really feels (to me) like the first book in a series, deserving of at least one more book to tell the full story. But I do have to admit, I liked the way it ended, despite feeling that the ending came too soon. 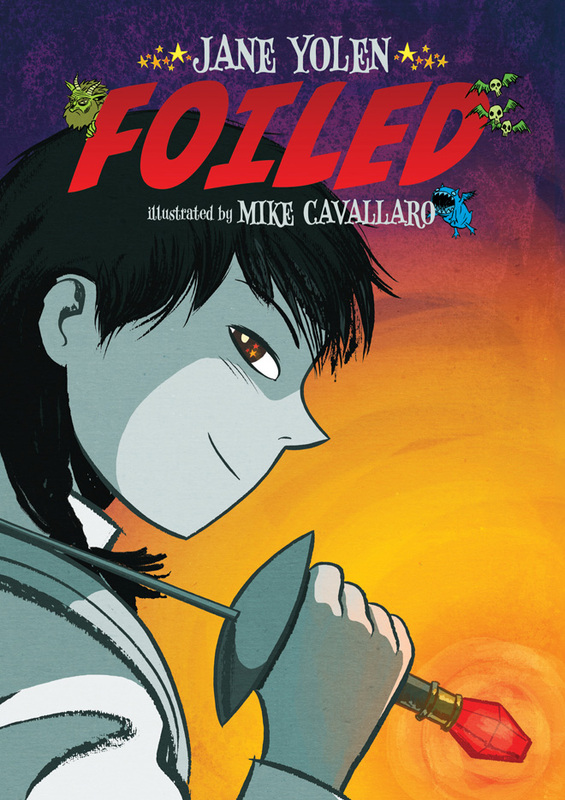 Foiled is published by First Second Books and retails for $15.99. You can read an excerpt on First Second’s website, and even download a PDF of the Foiled board game (though I’ll warn you that the game is kind of like Candyland—pretty to look at, but not much of a game). Wired: A curious combination of fairy tale, high school romance, and fencing that really seems to work. Tired: It ends just as it gets really interesting. Update, 6/12/10: Oops. As jpspeno points out, there is a second book coming. I’d skipped to the story on Yolen’s page and missed that, and the PR materials I’d gotten didn’t mention anything about a sequel. Looking forward to it! Disclosure: First Second Books provided a review copy of Foiled.